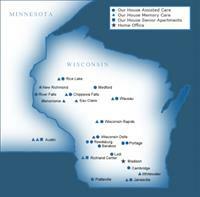 Our House Senior Living has been a primary senior living resource in Wisconsin and Minnesota communities for over 15 years. Proudly part of the Keystone Senior Management Services family, Our House maintains a prudent, conservative rate of growth and company-wide occupancy numbers that are in the top 5% of senior living communities nationwide. Choose Our House Senior Living with complete confidence that we will provide excellent care and value to you or your loved one for many years to come. Our House Senior Living Memory Care provides security and care to seniors with dementia and other forms of memory loss. It is designed to support seniors who can no longer live alone in their community. 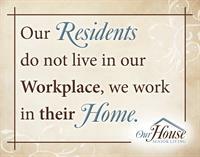 Respect, dignity, and independence are the foundation of the care delivered at Our House Senior Living Memory Care. Compassionate staff are trained to tend to residents who exhibit memory loss and need guidance and direction.